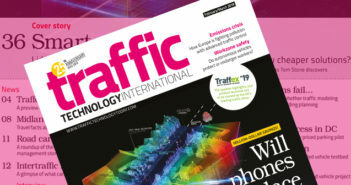 UK-based automotive engineering consultancy Ricardo has published a white paper giving technical insights on the key success factors in the commercial market testing and launch of Mobility as a Service (MaaS) innovations in advance of a webinar on February 7, which will present and discuss the issues raised for the future of transportation. The report states that the international automotive industry stands on the cusp of potentially the largest transformation since the dawn of mass production. 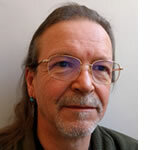 This will be driven by several concurrent influences, notably electrification and connected and automated vehicle technologies (CAV), but perhaps the most profound changes will be in the manner of vehicle use. This is predicted to move from a model dominated by personal vehicle ownership and use, to one predicated on the provision of MaaS. Vehicle-to-vehicle (V2V) and vehicle-to-infrastructure (V2I) connectivity, supported by fast 5G data services and blockchain payment authentication, is developing in parallel to the development of SAE Level 4 automated driving technology. At the same time, insurance models and legislation are both beginning to allow driverless vehicles onto public roads. This emerging transportation ecosystem supports the economically viable introduction of robotic taxis, automated shuttles and delivery drones for urban environments. In terms of the costs of the automated vehicle technologies that will enable MaaS innovations, Ricardo analysis suggests that the cost per mile of robotic taxis will be around half that of personal car ownership, even if the autonomous technology is significantly more expensive than that of traditional vehicles. As people start to share taxi rides, the cost per mile falls to less than 17% of the cost of personal cars. Figures like these indicate that the tipping point away from personal car ownership in city zones that can be well served by robotic vehicles could arrive very soon, with traditional ride hailing and vehicle rentals continuing to service travel outside city zones. 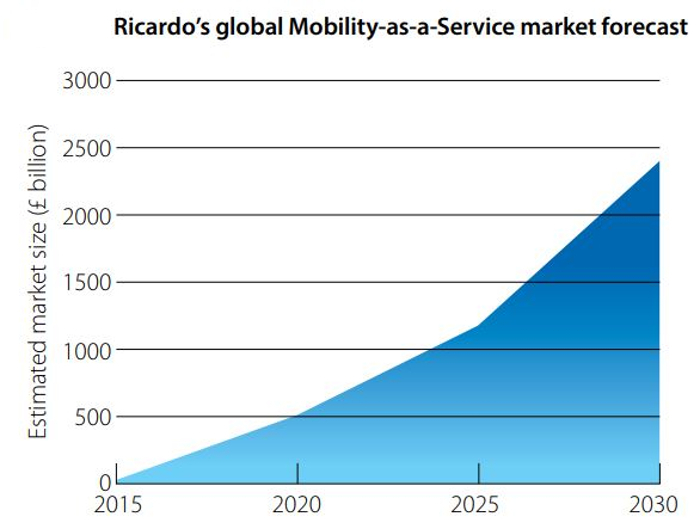 Ricardo’s white paper, Identifying markets for future mobility services, outlines the key steps that companies within the existing automotive value chain should take when bringing MaaS innovations to market. 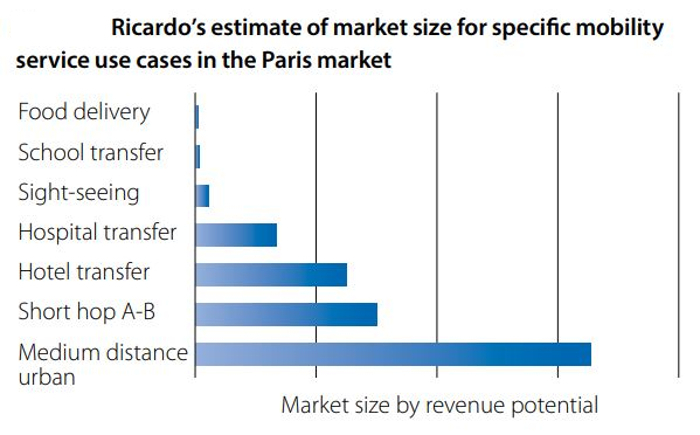 The paper draws in particular upon an in-depth field market study conducted by the company on the city of Paris, France, to characterize existing mobility services and benchmark their potential future market size. Key findings of this study are included in the paper and will be explored more fully in the upcoming webinar. 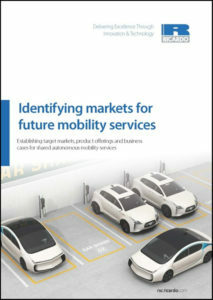 “With the commercial development of Mobility as a Service innovations, there is a real opportunity to improve the currently very low levels of asset utilization for passenger cars, replacing current models of vehicle ownership, and perhaps even taking the place of conventional public transport too,” commented Marc Wiseman, president of Ricardo Strategic Consulting USA.